No business can succeed without attracting and keeping loyal customers. As an old saying goes, our customers are our greatest asset. Your ability to maintain long-term relationship built on trust determines your business success and profitability. As business owners, it’s imperative that we recognize the importance of people who are happy to do business with us again and again, and recommend your company to others. In fact, not only they are your greatest achievement and source of profit, they also are the strongest marketing resource ever. It’s especially true today, in this age of technology and instant online communication, when “word of mouth” becomes “word of mouse” by spreading stories of customer experiences through social networks and review websites at a rate of knots. Did you ever stop and think about what makes customers stay with your company and what can force them to switch to a competitor? I bet you did. 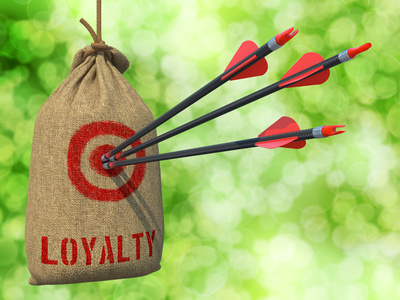 In this article I’d like to share a few ideas on how you can create a lasting customer loyalty for your business and how to get more of it. There has to be a reason to have relationship, especially if it is a lasting one. If you show a true interest in doing business with your existing customers and prospects, you are more likely to build strong and long-lasting relationship. As Apple’s former retail chief Ron Johnson once put it, “Care about a customer’s heart, not just her pocketbook.” In other words, don’t treat people coming to your website or office as one-time transaction, do all your best to evolve it into a fulfilling partnership. Good customer service matters. More often than not customers stop doing business with a company because it fails to deliver on customer service. Conversely, positive customer experiences result in repeat business. A quote by Leonard Berry states “Great service is about attitude. In addition, a service attitude leads to a richer quality of life, not only in the commercial sector.” Put customer service at the heart of your strategy and show your positive attitude to every person who happens to contact your support team. Make sure that there’s an easy, clear and accessible way for customers to communicate with you, whether it’s in Live Chat, by phone, or in person, and that you have someone assigned to customer service on an ongoing basis. Your employees treat your customers the way they themselves are treated. And those who meet the customers (and sadly those who often are the lowest-paid employees) are the face of a company. If it has high turnover of employees who quit and need to be replaced, it will face serious challenges. Not only it costs more to attract, recruit, and train replacements, but also brings along the brunt of customer dissatisfaction by dealing with unhappy employees day after day. In this sense, loyalty starts at the top and works its way throughout the company. “Just as we thank our customers for doing business with us, we thank our employees for doing a good job. That’s a big deal” – state Carl Sewell and Paul B. Brown in ‘Customers for Life’. In today’s competitive environment it’s vital to treat your customers as individuals, not slices of market, with due respect to their unique preferences and needs. Genuine attention and human touch make them feel special. Whenever it’s possible, make sure you are ready to meet those individual customers’ needs and desires. By listening carefully and taking their opinion into account, you can establish better rapport with your customers and also deliver tailored products and services that work for them. Another great thing you can do is to make sure you and your employees get to know the names of regular customers. People appreciate it when you make the effort to call them by name. Such an approach makes them feel important and respected, and might become another reason why they keep coming back. Many businesses today are putting too much energy and effort into attracting new customers. A recent research carried out by The Grass Roots Group, revealed that it leaves regular customers feeling frustrated, with just under half (49 per cent) even considering switching loyalties if a provider’s special offers are only available to new customers. That sounds too disturbing to ignore. No matter how much you market and advertise to get new customers, always spare a thought for those who have been with you for years. Are your employees authorized to offer anything special to regular customers just in case they happen to walk by your new promotion stand or see new campaign banner ad on your website? We believe that customer loyalty cannot be motivated — or bribed — by a company’s gifts, discounts, or other purchase rewards, but we are sure that your strategy should reflect your recognizing its importance. In order to earn and maintain customers’ trust and credibility be super clear about your delivery, fees and refund policy. High delivery rates and hidden charges are reported to be the two most important reasons why customers abandon during checkout according to an eConsultancy survey results. Unexpected changes in these two areas might also upset existing customers, especially if the rates have increased significantly since their last transaction. Any time you have to face your pricing structure change, remember about the importance of keeping your promise and be as thoughtful, transparent, and straightforward as possible. According to Gail F. Goodman, the author of “Engagement Marketing: How Small Business Wins in a Socially Connected World“, it’s just good business practice to keep in touch with customers and clients. Building these connections is important for two reasons. One, it drives repeat sales. Keeping in touch via email and social media helps draw people back to your business. And it keeps you top-of-mind. Even if people delete your email newsletter without reading it or only glance at your social post, your name sticks around. It’s important to set up a system for reaching out to the customers you already have. Dedicate time to creating and maintaining a database of contact information, invite people to your company page in social networks and make sure you can offer some good reasons to stay in touch. For instance, you can share or pass on some useful information (not necessarily advertising of your products), or offer other sort of support to the community. This kind of communication will pay off in the long run. By staying in touch you will also learn a lot from your connections and better understand your customers’ individual needs, which is a key to any business success. Have you ever had an experience of being treated as respected customer for staying loyal to a company? What would force you consider switching loyalty? Do you have any other inspiring examples to share? Tell us your story through the comments section, we would love to hear from you. And as always, thank you for reading our blog! This entry was posted in Articles, Tips and Tricks and tagged customer loyalty. Bookmark the permalink. Great article, with excellent pointers – I wholeheartedly agree with the content – the most rewarding part of my day is saying thank you to team members and receiving beaming smiles in return – everyone likes to be appreciated and when a job has been done well praise should be given. In my many years in the hospitality industry, too many managers forget to praise and only pick up on mishaps, resulting in demoralised team members. Thanks Rosalind, those are excellent points. Failing to motivate and encourage your employees is one of the main reasons of bad service and customer dissatisfaction, and as a result, both employees and customers might consider switching elsewhere. Excellent Article. Came across it on flipboard. These points touch upon the most important things businesses need to be doing to retail loyalty and not be caught in the glitz of the new, perfect customers. Thank you very much for your comment Nikita. Glad you read the article and found it helpful. Great article. I particularly found the talk about engagement with our customers to be informative. We too often get into a set way of doing things and forget to really reach out and make a personal impact on each customer individually, based off of their own needs. Great tips for any level of business. Some of the bigger conglomerates would do well to remember them. Awesome Article. As an entrepreneur I totally understand and agree with all these points discussed, and have been doing exactly all of these things mentioned… Intuitively. It’s nice to see that so far at least, I’ve managed to stay on track.